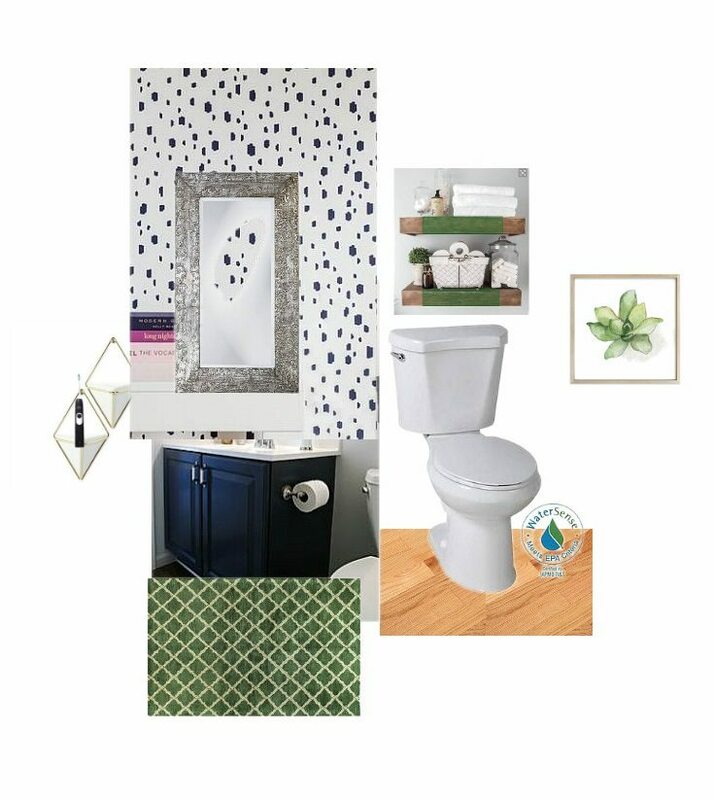 Making-over your small bathroom? This post is full of small modern bathroom inspiration! 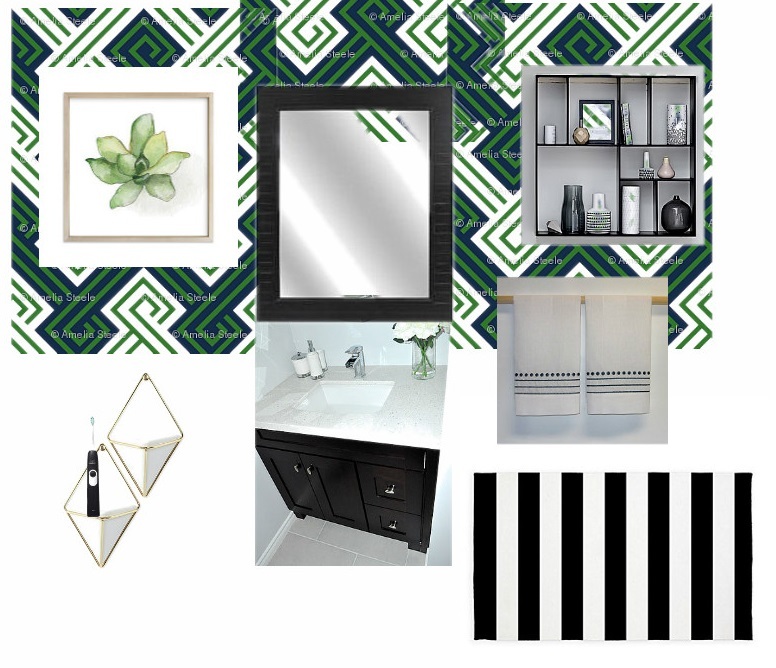 Come along as I transform my traditional style bathroom into a chic modern bathroom style! These small bathroom decor ideas can help you to transform your powder room from a traditional style to a modern bathroom design on a $100 budget! Hi, friends! Thanks so much for taking a walk down memory lane with me during my Best and Missed of 2016! It’s always so fun for me to take a moment to see all that we were able to accomplish over the year. After putting away all of the Holiday decorations, everything in my home looks a bit empty. Those spaces I’ve been putting off tackling are even more evident to me now that I’ve fewer pretty distractions. I’m so ready to jump feet first into the New Year and new projects! But, of course, it’s January. January is right smack-dab in-between the Fall One Room Challenge and the Spring One Room Challenge, times when I’d be taking on full room projects. This could be a good thing or a bad thing, depending on how you look at it. But, given that we just finished with Christmas, I’m choosing to look at it as a very, very good thing! I have plenty of time to participate in this month’s $100 Room Challenge, hosted by Erin of Lemons, Lavender, and Laundry! Scroll to the bottom of this post for the full list of everyone who is participating, as well as the rooms they’ll be making over. If you’re looking for the full story on what exactly a $100 Room Challenge is, Erin spells it out clearly, but I’ll give you the paraphrased version. Pick a room. Make the room over in one month. Spend no more than $100. You guys, I’m SO EXCITED! 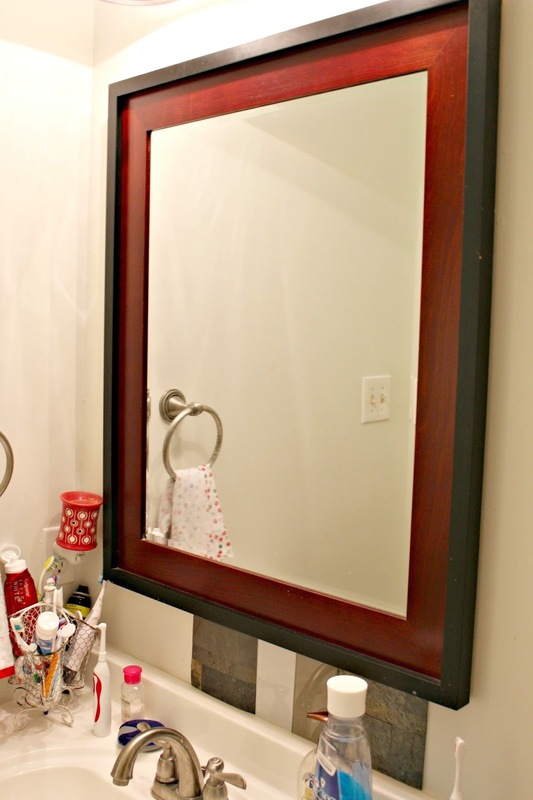 I decided to tackle my powder room – Lordy, does it need help! This room has been a work in progress for some years. 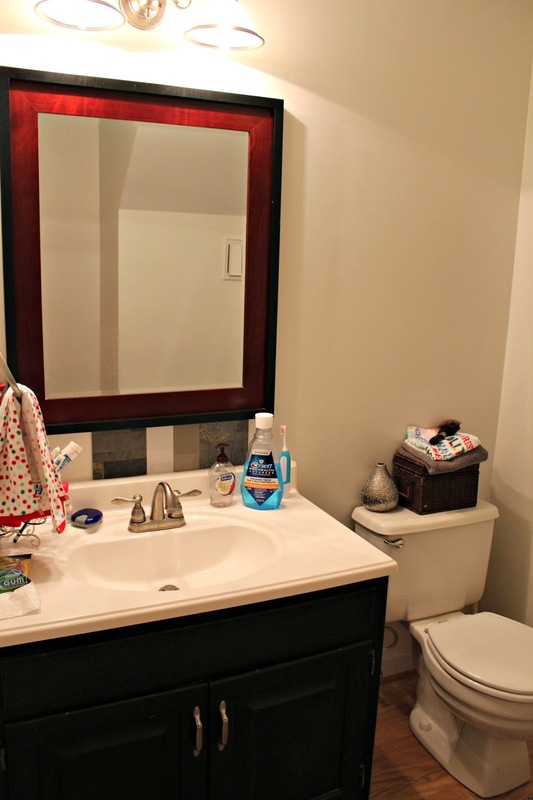 I repainted the vanity a few years ago, and we replaced the sink and counter, as well as the hardware, and we’ve painted it recently, but the room has no character at all – save for that Christmas hand towel that apparently got left behind in the Christmas decoration purge! Oops! In addition to being the bathroom our guests use #embarassing, my children also use this bathroom to do their hair – teen girls – and brush their teeth. Apparently, an entire football team cleans their teeth at this sink with all of those toothbrushes! It’s also our storage for first aid, Halloween make-up, and a million other things bathroom related that we’re too lazy to lug upstairs. With all of that, there isn’t nearly enough storage. And, yes, that is toothpaste on the floor. Excuse the mess – this is real life! I’m sticking with the existing vanity, sink, and faucet. I’m not sure about the mirror. Everything else is open to change. I’ve been busy gathering ideas on Pinterest, but I’m still working some things out. This is my wishlist, but it’s not likely I’m going to stay within budget and still get all of this stuff done. However, I’m going to try! Add some bold pattern to the walls – I’d love to wallpaper, but I don’t think that’s going to be in my budget. Perhaps a stenciled pattern instead. Find a better solution for toothbrushes and hand towels. Maybe shelves over the toilet? 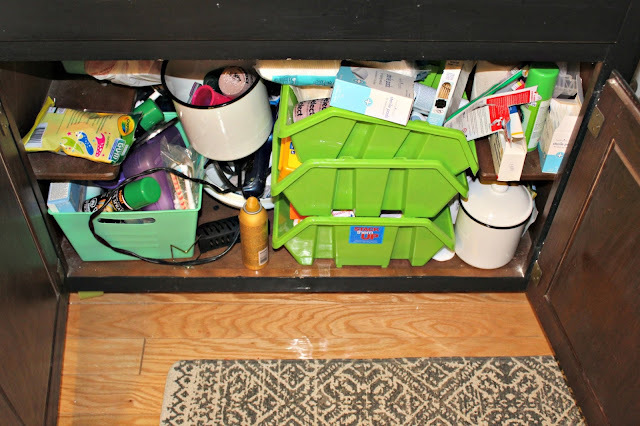 Organize- We do not have a medicine cabinet anywhere in the house, but we do have a significant amount of unused space behind the bathroom door that could be put to good use for this purpose! Purging can’t hurt either. Change the artwork – I love the birds and may keep them, but I would like artwork with a little more presence. 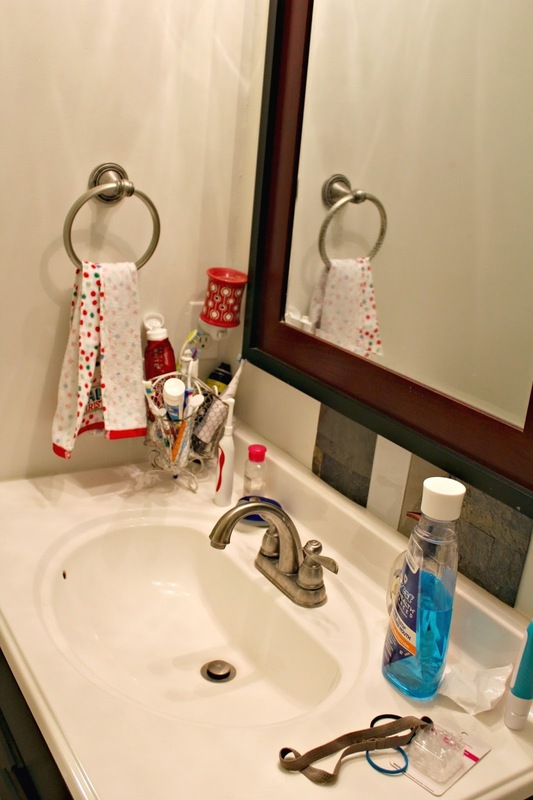 Replace the trash can, toothbrush holder, and towel bar. 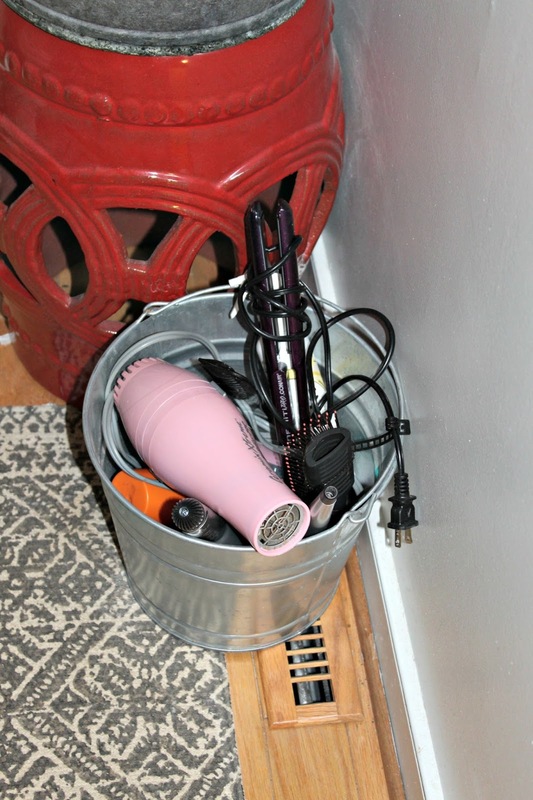 Create storage for hair products. 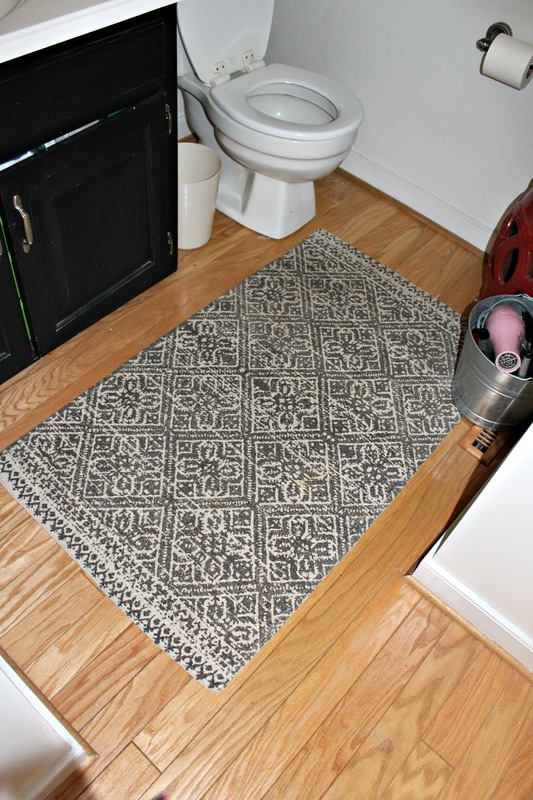 Consider replacing the rug – I love the carpet, but I may end up replacing it if it doesn’t go with the wall treatment. 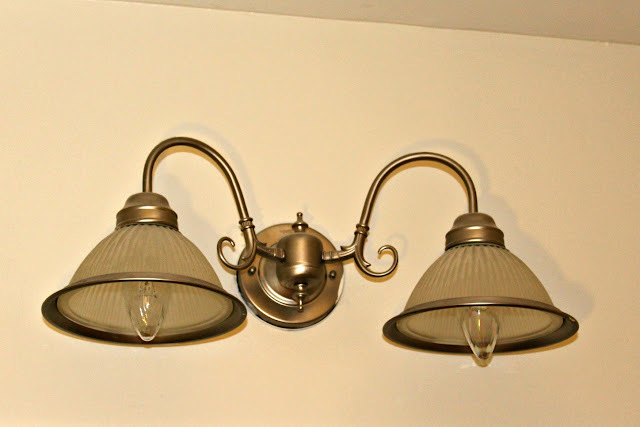 Change the lighting – It’s not awful, but if it’s in the budget I’d love to do something fun and funky with mini pendants. With a budget of $100 I’m going to have to get creative, I’m going to have to be crafty, and I’m going to have to be much more careful on what and where I spend my money. Can you say no vanilla lattes? *This post may contain affiliate links for your convenience. Click here to read my full disclosure statement. Each week for the next four weeks I’ll be sharing my progress with you – I hope you’ll follow along! So, without further adieu, let’s get this party started! Before you go, take a look at all of these other fabulous participants. 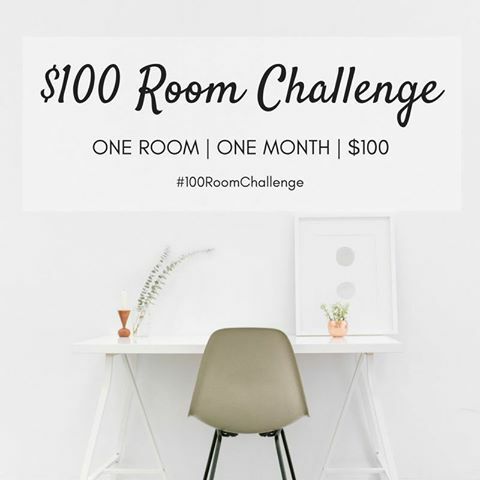 If you would like to follow along with the $100 Room Challenge, you can subscribe via email HERE and never miss a post. Facebook // Pinterest // Instagram // Twitter // Google+ Don’t forget it, Pin It! Can't wait to see what you do. I need to makeover our powder room so I will be following along with all of you. Oh, that's going to be so lovely. We are also taking on a bath. I SO love real life pictures! You have wonderful ideas for this space. I know $100 might not get everything on your wish list (I have a light fixture on mine. Hmmm… for $100? ), but think of how far we'll come 🙂 Can't wait to follow your progress! That's a lot of stuff for that small space! Making an accent wall will add a lot of character for sure! Oooh! I love your inspirations! We are doing a bathroom as well, and is about the plainest space ever. Can't wait to see all you do! P.S. love that rug, but can understand it might not match with a stencil. I'm glad I'm not the only one who always leaves a piece of Christmas decor behind! Can't wait too see how your plans come together! 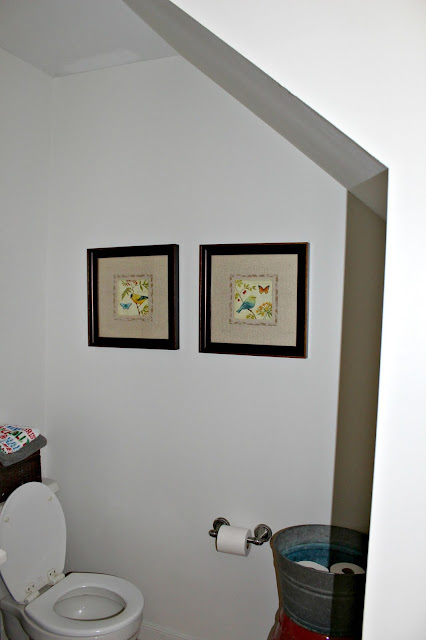 The powder room is a great room to tackle and it looks like you are full of wonderful ideas. Looking forward to seeing it. Can't wait to see the green in your mood board come to life! This is so much fun! I am getting a kick finding buys! Love the choices for your bath! I love the direction you're going in! I think organization will be a challenge, but I think it'll all come together. I love your mood board and you have some really great ideas! I can't wait to see it all come together. Your inspiration board is amazing! 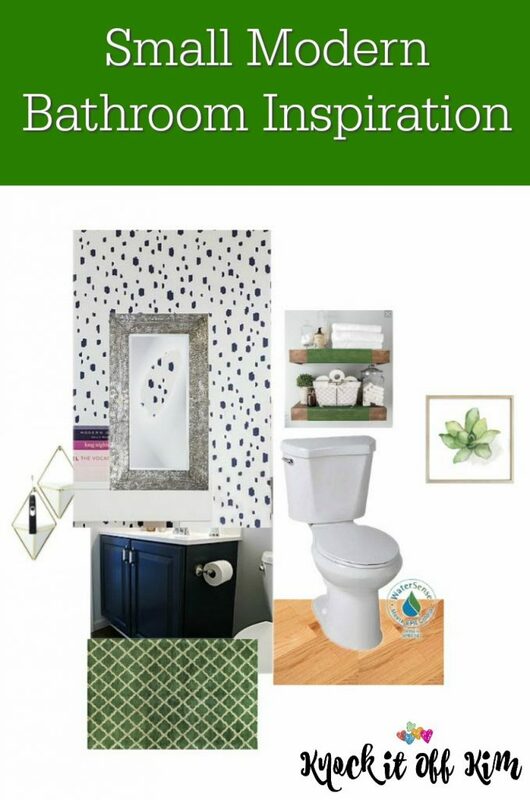 Can't wait to see the transformation in your powder room and on such a tight budget! I love your ideas for this room and can't wait to see how it all turns out! I love your design plan! I cant wait to see how it turns out!